...well I am...ummmmm (continuing) I would like to make a toast, to a great host and hostess in Oklahoma City this past Spring Break. My sister (her blog) and her husband showed my kids and I a wonderful time during our visit. I can't wait to go back. So...you all know that I love to have coffee with my sister, if we lived near one another I think we would have coffee or tea together every single day...seriously. 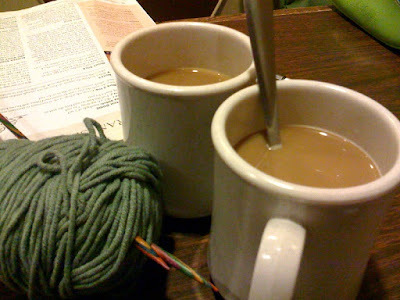 Any-who here is a picture of our two coffee cups - yes, she was knitting and I was checking email...it was GREAT!